You pay nothing at the time the student is assessed. After the learning plan is created, we will meet to discuss the plan so you can decide whether you want to enroll the student. If you do not enroll, you pay nothing. If you choose to enroll, the one-time initiation fee (which covers the assessment and all materials) is normally $150. For a limited time, we are discounting this to $99. This offer cannot be combined with other offers or discounts. Call Now (918) 574-2222 Ext 1 and Let's Get Started! My son excellent in math now. He loves going to Mathnasium because he can see the value it brings and increased skill set. It’s been a great experience for him. We are big believers in Mathnasium. The results we have experienced or nothing short of spectacular. We love Moriah and how she really takes the time to know exactly where our daughter is in her ability level. The tutors are always pleasant and positive. The additional time on Fridays are extremely helpful in allowing us to meet our attendance goals and continue with mathnasium! Thank you! Our daughter Madison has excelled in math since starting the program. She doesn't get anxious or upset about math homework like she use to. Very worthwhile program. My son went to Mathnasium for help in a college precalculus class this semester and what began as a rough start, ended with a 94 on his final exam! Kudos to Mathnasium for finding him a tutor! I appreciate all of the extra attention that my daughter needed to start doing well. Her attitude about math doesn't seem to be so negative anymore...and that helps a lot! It is really great. It motivates my child to learn more Math. The staff is motivating and really nice. Thanks for all what you do. Ana B. My daughter has grown leaps and bounds since starting Mathnasium in October. The staff is encouraging and patient with my daughter which is extremely important to me. So glad I found this place. Both of your kid's have only been doing it for about a month so I am not a great testimony for how much they have learned, improved, etc. But, both my kid's were dreading going and enrolling but after the first session they said it was fun. They don't always go willingly but when I pick them up, they say it went fine and was good. :) The "rewards" are a great incentive and helps motivate my son, especially. Our daughter loves Mathnasium. We like it, however, it is hard to get her there for the 10 times a month with Fridays being closed. Our daughter has struggled with math her entire life. After a year at Mathnasium she has an “A” in math at one of the toughest schools and Tulsa! Thank you Mathnasium! My daughter has only been coming for one month but I can see such a change in her overall confidence about Math. She enjoys all the tutors and everyone makes her feel really special and cared for and her grades are improving. I’m grateful! Whether we want to catch up on Math or get ahead, Mathnasium is there for us! The staff is very involved and happy to help. Loving the experience thus far!!! We have been so oleased tonsee out daughter WANT to do math. She has struggled with math for years and has a negative emotional reaction to doing math, except for when she goes to Mathnasium. Mathnasium has been a wonderful experience, and all of their people professional and helpful. Both of my sons have made huge gains in their understanding of math in just their first month at Mathnasium. Mathnasium has placed our son at the top of his entire grade in math! It has instilled confidence in him and has caused him to love math! He also scored a 99 in the math section of state testing!! We are so grateful for Mathnasium! Our child has shown tremendous improvement in only a month of instruction. She has fun and wants to go to Mathnasium!!! Thank you!!! My child has gained so much confidence. He’s been worried that middle school will be too hard. But I really think he’s getting exactly what he needs there. We love Mathnasium! They were able to test my daughter to see where she needed help and then filled in her learning gaps. I’m highly impressed with the director and tutors. Mathnasium continues to impress with the care and ability of the staff, and that along with their continued skill at teaching fundamental to complex mathematics. That skill has shown in our son's great improvement at school and in ACT testing. These greatly improved math skills has also shown in study habits in other subjects. 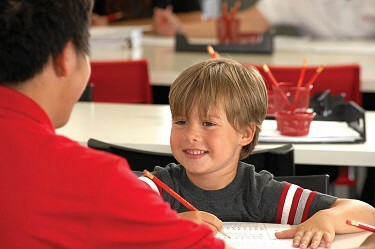 Mathnasium is an absolute must for those families looking for improved math and study skills. The grandchildren love to come to Mathnasium. This is a refreshing change for them to be enthused about doing extra work - especially in the summer! Our daughter’s improvement has been dramatic. While she will still never tell anyone she likes math the Mathnasium program has given her the skills and confidence to perform in the classroom. My daughter is no longer scared of geometry. She is much more confident, loves the staff, loves the flexibility and looks forward to her sessions. I feel like my daughter is really mastering the concepts, but I do wish she could move along a little faster. Mathnasium remains the best experience and teaching tool for math improvement for our child. We have been consistently pleased with everything Mathnasium has done and we recommend this highly for anyone who needs to improve your child's math skills. I THINK ALL THE PRACTICE IS FINALLY KICKING IN, IT SEEMS LIKE MATH IS GETTING EASIER ALL THE TIME, NO MORE LATE WORK AND A'S AND B' ARE THE NORM NOW. HOO RAY. My daughter's skills and motivation towards math has improved dramatically in the past year! I have told so many people about Mathnasium! I love it! I have 4 kids enrolled ranging from 1 advanced, 1 on an IEP, and 2 in between (who have specifically struggled in 4th grade). The confidence they now have with numbers has changed their feelings about math and they're now bringing home A's! I can't help but wonder how this could affect their career choices in the future. A worthy investment. We love Mathnasium! The only negative is that with our busy schedule we are only able to come 1- 2 times per week. The monthly fee seems more in line with 3 -4 sessions per week. I feel like it’s really helping my child, and she actually enjoys going, which I didn’t think would happen. Since we homeschool, I just wish Mathnasium was open earlier in the day because sometimes it’s hard for her to get there in the evening. We loved our time at Mathnasium! Our daughter made a perfect score on the math portion of the Oklahoma state tests, and our son got to explore math and engineering topics as quickly as he could go—about 2 grade levels ahead! We only stopped because we moved away. The management is terrific, and the tutors are high-quality people doing high-quality work. My kids always wanted to go—even asked to go extra days! In one month’s time, my daughter’s confidence in her abilities has improved, and her geometry grade has improved by a letter grade. My daughter loves mathnasium. The tutors there provide excellent activities and are very nice. My daughter's confidence in math has soared! She is making As now even though she was way behind in the summer. She enjoys the teachers too. The experienced, caring staff at Mathnasium helped my son not only improve skills, but moved to advanced math! My granddaughter has already improved immensely, based on her ability to quickly finish math homework and finally finishing tests. It's really a miracle for our family. The stress is lifted from my son's family and this after only six weeks! We cannot thank you enough for your help and now we are aiming at surpassing her grade level, and beyond! Our daughter loves going to Mathnasium. She looks forward to each session. My 2 oldest have struggled with math, and homework was a nightmare! Now math is both of their strongest subjects. Mathnasium's approach is perfect for filling in any missing "holes" in their learning and helps them move forward in math with ease. Love it! My second grader refused to do anything related to math before going to Mathnasium. He wouldn't even try. A couple of days ago, he chose to do math on the computer on a day off from Mathnasium, then he started teaching his 4-year-old brother some basics. That's after only a month and a half of going to Mathnasium twice a week! I have referred two families to you. One did not want to spend that much on a group setting tutor experience. One family actually signed up for the summer months. Although we are seeing progress in our daughter, they did not have as much success. We will continue to share our positive experience but maybe with the caveat that it is good for long-term success, not a quick-fix. My 13 year old does not give us a hard time about going..That is saying something. Our son's grades at Jenks went from C's to high A's with 2 sessions! MATHNASIUM IS AMAZING! Best experience ever for my 14 year old son! He loves Mathnasium. Our son said "It's amazing, and fun! Usually Math is not as fun, but they make it fun!" My son is currently participating in your program and is learning methods helping him to understand math concepts he has struggled with in the past. He is actually enjoying the lessons and looks forward to going to his next lesson instead of dreading it. This is a very welcomed change for both his father and myself. My son is relating to and enjoying the instructors too. We appreciate your program very much! All 3 kids love it! You have excellent tutors who work miracles given the physical space they have. For reasons that would be of no interest to the public, and had nothing to do with Mathnasium or its teachers, I had difficulty bringing my high school aged son after school at one point in the year. I will contact the manager to discuss this with her. I would like to see what this year's school math instructor thinks about his need for help in math. His freshman geometry teacher felt he had gaps in understanding math concepts, hence our enrollment in Mathnasium; this year's teacher was not fond of his trying to work ahead, and wanted to help him at school. We may or may not continue, depending on school extracurricular activities and his need for help. Nevertheless, I feel that he benefitted greatly from the Mathnasium program and teachers. Thank you! They have really helped with my child's confidence and scores in math. Flexible, helpful and fun for our daughter! My kid never complains about going to math! We've been very pleased with Bella's progress and increased confidence with her math knowledge. My daughter has always struggled with math but stayed on track at school. Before her junior year I enrolled her in Mathnasium to prepare her for Algebra II and to help her scores on the ACT. After a year she raised her ACT from an 18 to a 24. She continued with Mathnasium through College Algebra her senior year. Caitlin has been great in working with my daughter. Her confidence in her math skills has greatly improved. I have children gifted in math and they enjoy the enrichment and it keep them ahead in their classes. If they have a concept not understood in class, they are thought it with ease and are able to master the topic. The team has been great. There was significant thought and effort to determine skill gaps and put together a plan to fill those gaps. great learning experience! wonderful staff! My son has been gaining confidence in his math skills since he started Mathnasium. We are pleased with the progress. He never says, "I don't want to go to math." After struggling with math for a few years, I decided to give Mathnasium a try for my 12 year old daughter. She wasn't excited about getting help. She changed her mind after her assessment, which she described as fun. This is a child who gets very frustrated with math and never refers to it as "fun." She looks forward to going every week and seems to enjoy it. Although we are taking a brief break currently, Mathnasium has really helped Rachel blossom with her math skills! The staff is really.friendly.my daughter is getting better on mathematics, she says is really helpful. I do recommend Mathnesium. Mathnasium has enabled our daughter to feel better equipped in school. It has made a great difference in her attitude and aptitude! We appreciate the flexibility to help our son prep for special trying at school, and homework. Our experience to date has been very positive. Our daughter has been reluctant to ask for or accept additional support in the past and the team has engaged her in a way that's made her feel much more comfortable saying "I don't know how to do this". That alone has been worth the cost. Sutton loves going....he is very competitive and Mathnasium challenges him. They make learning fun and he enjoys going. We don't have to make him go, he even asks when is he going next!! Everyone there is great to work with. Caitlin Norton is a highly competent and talented instructor. We watched our sons math grade go from a D to an A! We are thrilled with the program and will continue to come! My kids always wanted to go to Mathnaseum. It is a great learning environment with positive rewards and reinforcement! My kids felt better prepared for their math tests at school after their review sessions at mathnasium. I couldn't ask for nicer, more competent Math teachers than the exceptional staff at our Mathnasium. I feel that my son is getting a solid math foundation here. I would love it if they could open a more central Tulsa Mathnasium! Mathnasium is by far the best environment for every child. The learning procedures are fun and stimulating for children. Instructors are very professional and educated. The environment makes math exciting. Thanks. Sutton loves going! He's very competitive and is challenged in a fun way where he is learning!! Great program to help kids with understanding math. The teachers are outstanding! Mathnasium has been a great experience for us. We were unable to attend over the summer due to my father's illness and I was gone most of the summer. The summer hours available made it a hardship to make it. We have missed it. The teachers are great and have helped our granddaughter to become successful in her math classes. It has been a great experience and a great way to get the math skills my kids need. We are fairly new this summer to Mathnasium, and our son is entering 10th grade in August. We like that the Mathnasium team has assessed his math concepts and know exactly the areas in which he needs remediation/support. He likes that he does not get help through rote, repetitious drill, but from people who can explain what he needs to understand fully before he goes on in higher math. It is good to feel that he is getting the help he needs in a way that he can learn it. The students we see while he is there are working in an orderly environment with the most patient tutors I have ever observed. His bonus comment:"No homework! Just a lot of work while I am there..."
Mathnasium is fascinating and exciting! Techniques of learning are personalized and fun for students.The atmosphere is so positive that you fall in love with math! Mathnasium-plus-learning-equals success! We can all benefit from Mathnasium-as a student, parent or friend. A midtown location would be great! My three children have diverse math needs, all of which are being met. First rate program. My son enjoys going and feels he is learning each session.